Mesentery, Artery - Pigment in a male F344/N rat from a chronic study. 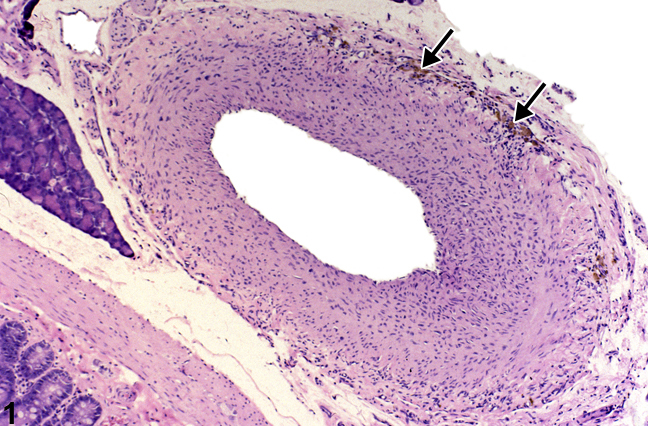 Brown pigment is present in the wall of the artery (arrows). Mesentery, Artery - Pigment in a male F344/N rat from a chronic study (higher magnification of Figure 1). 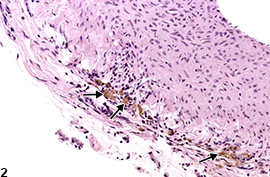 Macrophages containing brown pigment consistent with hemosiderin (arrows) are present in the arterial wall. Pigment is relatively common in laboratory rodents. The three most common endogenous pigments encountered in conjunction with the vascular system are hemosiderin, melanin, and lipofuscin. Hemosiderin is identified as a golden brown globular pigment, while melanin is composed of course black granules. Lipofuscin is defined as a finely granular yellow to brown pigment. In blood vessels, pigment accumulations are most often found perivascularly, and the most commonly encountered pigment is hemosiderin. 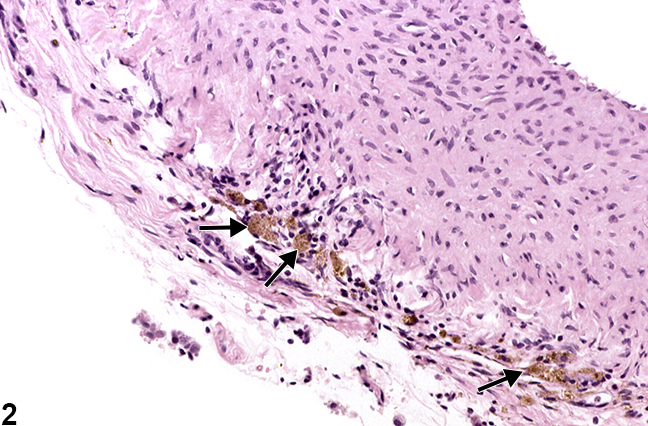 Perivascular hemosiderin accumulation is most often seen as cytoplasmic accumulations of golden brown globular material in macrophages associated with previous sites of hemorrhage ( Figure 1 and Figure 2 ), including draining lymph nodes. Perivascular hemosiderin is commonly noted surrounding the small vessels in the lungs of rats and mice and may also be associated with intravascular procedures or any damage to the vessel that leads to hemorrhage. It is also frequently seen as part of the spectrum of lesions in polyarteritis. In addition, melanosis of vessels may occur in the choroid of the eye in nonalbino strains, and lipofuscin may be found in the retina of aging F344 rats. With permission from the NTP pathologist, special stainings may be conducted in cases where the pigment type cannot be determined. Hemosiderin is composed primarily of iron and will stain bright blue with Perls’ Prussian blue. Lipofuscin pigment may be confirmed with Schmorl’s stain, oil red O, or Sudan black B. Lipofuscin granules are typically periodic acid–Schiff positive and produce a discrete bright orange autofluorescence on slides stained with hematoxylin and eosin. Melanin granules are best detected with a Fontana-Masson stain. Vascular pigment should be diagnosed when it is considered to be relevant to the study (or if it is unclear whether it is relevant to the study) or if it is unusually prominent. Pigment should be recorded in the organ affected; the type of blood vessel affected should be specified as a site modifier (artery or vein). If the type of blood vessel cannot be determined, the site modifier "blood vessel" may be used. Pigment in protocol-required blood great vessels, such as aorta, should be recorded with the blood vessel as the site (e.g., Aorta - Pigment). Not all pigments have to be diagnosed, as some are ubiquitous in aging animals or are secondary to another disease process (e.g.,hemorrhage) and not toxicologically meaningful. The pathologist should use his or her judgment in deciding whether or not the pigment should be diagnosed. Definitive pigment identification is often difficult in histologic sections, even with a battery of special statins. Therefore, a diagnosis of pigment (as opposed to diagnosing the type of pigment, e.g., hemosiderin or lipofuscin) is most appropriate. The pathology narrative should describe the morphologic features of the pigment and its location. When pigment is diagnosed, it should be given a severity grade based on the amount of pigment present. Kandemir O, Buyukates M, Kandemir NO, Aktunc E, Gul AE, Gul S, Turan SA. 2010. Demonstration of the histopathological and immunohistochemical effects of a novel hemostatic agent, Ankaferd Blood Stopper, on vascular tissue in a rat aortic bleeding model. J Cardiothorac Surg 5:110-116. Maratea KA, Snyder PW, Stevenson GW. 2006. Vascular lesions in nine G&ouml;ttingen minipigs with thrombocytopenic purpura syndrome. Vet Pathol 43:447-454. Peters S,Lamah T,Kokkinou D,Bartz-Schmidt KU,Schraermeyer U. 2006. Melanin protects choroidal blood vessels against light toxicity. Z Naturforsch C 61:427-433. Renne R, Brix A, Harkema J, Herbert R, Kittel B, Lewis D, March T, Nagoano K, Pino M, Rittinghausen S, Rosenbruch M, Tellier P, Wohrmann T. 2009. Proliferative and nonproliferative lesions of the rat and mouse respiratory tract. Toxicol Pathol 37:5S-73S.